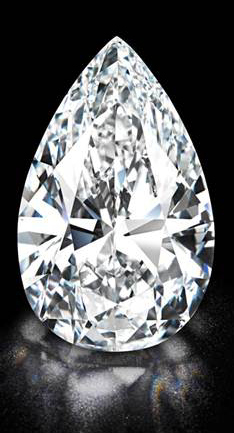 The Swatch Group and Harry Winston are celebrating their new partnership with the purchase of a pear-shaped, D color, flawless diamond of 101.73 carats for more than $26.7 million at Christie's Geneva Magnificent Jewels Sale Wednesday. The diamond was the top lot in a sale that fetched a record-breaking $102.1 million, selling 86% by lot and 93% by value, the highest result ever for a various-owner jewelry auction at Christie’s. It included several world records for diamonds, pearls and sapphires. A total of 20 lots sold above $1 million with 147 buyers coming from 31 countries across five continents, Christie’s said. * 19.88-carat cushion-shaped Kashmir sapphire, named “The Star of Kashmir” sold for more than $3.4 million, or $175,202 per carat, breaking the world auction record for a per-carat sale of a sapphire. * Single strand of natural pearls measuring from 13.7 to 10.4mm sold for more $8.4 million, setting a world auction record for a single-strand natural pearl necklace. Drop-shaped natural pearl ear pendants of 261.66 and 216.37 grains sold for more than $2.4 million, setting a world auction record for a pair of pearl ear pendants. * 1.92-carat fancy red diamond sold for $3.2 million, setting a world auction price for a red diamond.